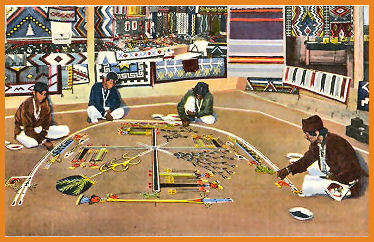 Authentic sand painting called �Whirling Log� handmade by Navajo Wilton Lee and signed on the back by the artist. It is framed in a 14 inch x 14inch walnut wood frame with triple matting. A photo of the artist is included. Shipping is Free. Signed by Artist, this authentic sand painting within the clock was created by Navajo Indian Eddie Foster of Shiprock, New Mexico. The sand painting clock is framed in a 15.25" X 15.25" honey oak wood frame with matting. A card photo of the artist is included and shipping is Free.